Katherine Whaley breaks down the options of getting to downtown Houston for the World Series. HOUSTON, Texas (KTRK) -- If you are lucky enough to have a ticket to the World Series games, or you are just planning to be in downtown Houston this weekend, make transportation plans before you leave the house! Friday, Oct. 20 - Wednesday, Nov. 1: Complete continuous closure of Avenida de las Americas between Capitol and Texas; Texas between Crawford & Hamilton; Crawford between Texas & Congress; Hamilton between Congress & Texas; and Congress between Hamilton & Crawford including the sidewalk. Find your parking space before you head to the game! The Downtown Interactive Parking Map shows visitors the best places to park according to destination and preferred lot type, and even offers parking reservations for some garages. Prices during the World Series will likely be higher than what is posted online. Garages and surface lots located west of Main Street will most likely be cheaper. Check the interactive map here: www.downtownhoustonparking.org. Ditch the cash and download the ParkHouston Mobile App to pay for your on-street parking space using a credit card. Beware, there are 3-hour time limits as well as some restrictions for on-street parking during weekdays, so be sure to watch for signage. Street parking is free after 6 p.m. Monday through Saturday and all day on Sunday. Greenlink Circulator - special route/hours for World Series! 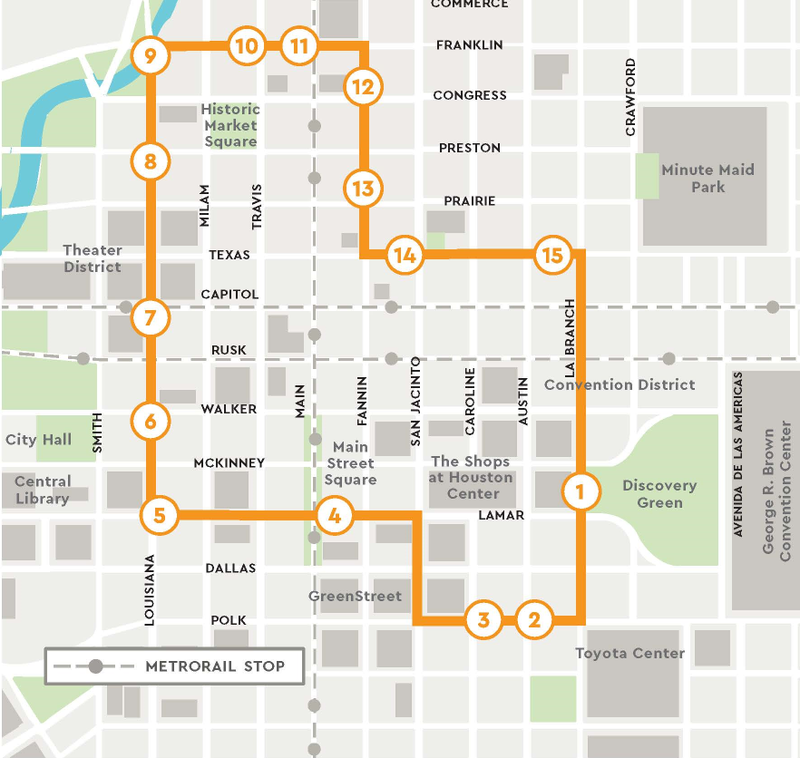 The regular route is detoured due to closures on Avenida, but all other stops remain, including 1 block away from Minute Maid Park, GreenStreet, Main Street Square, Theater District, and Historic Market Square. downtownhouston.org. Ride METRORail free if you have a valid Astros game ticket. www.ridemetro.org. For short trips around downtown Houston, consider Houston B-cycle. 15 stations are located throughout downtown Houston. The walk-up rate is $3 per 30 minutes. www.houston.bcycle.com. Leave the driving to someone else! Use Uber, Lyft, or Z-trip/taxis to avoid parking fees and enjoy a safe ride to and from the festivities. Friday, October 20 - Wednesday, November 1: Complete continuous closure of Avenida de las Americas between Capitol and Texas, Texas between Crawford & Hamilton, Crawford between Texas & Congress, Hamilton between Congress & Texas, and Congress between Hamilton & Crawford including the sidewalk. Friday, Oct. 27, 2017 2 p.m. - 10 p.m.
151 Westpark Exp. E/B - Via Franklin, Left San Jacinto to Mid Day Lot. 244 Monroe PM Inbound Via St. Joseph, Right San Jacinto to N. San Jacinto, Right into Buffalo Bayou facility (Mid-Day lot). 246 Bay Area PM Inbound Via St. Joseph, Right San Jacinto to N. San Jacinto, Right into Buffalo Bayou facility (Mid-Day lot). 247 Fuqua PM Inbound Via St. Joseph, Right San Jacinto to N. San Jacinto, Right into Buffalo Bayou facility (Mid-Day lot). 248 ElDorado PM Inbound Via St. Joseph, Right San Jacinto to N. San Jacinto, Right into Buffalo Bayou facility (Mid-Day lot). 249 Monroe/Bay Area/Fuqua/ElDorado Mid-Day and Late Night I/B - Via Franklin, Left San Jacinto to Mid Day Lot. 261 West Loop PM Inbound Via Elgin, Right San Jacinto to N. San Jacinto, Right into Buffalo Bayou facility (Mid-Day lot). 262 Westwood PM Inbound Via Pierce, Left San Jacinto to N. San Jacinto, Right into Buffalo Bayou facility (Mid-Day lot). 265 West Bellfort PM Inbound Via Pierce, Left San Jacinto to N. San Jacinto, Right into Buffalo Bayou facility (Mid-Day lot). 269 Hillcroft/Westwood/W. Bellfort I/B - Via Pierce, Left San Jacinto to Mid Day Lot. 6 Jensen / Greens Southbound via Navigation to Franklin: Right Chartres, Left Commerce, Left Jackson, Right Congress to regular route. 20 Canal / Memorial Westbound via Navigation to Franklin: Right Chartres, Left Commerce, Left Jackson, Right Congress to regular route. 30 Clinton / Ella Westbound via Navigation to Franklin: Right Chartres, Left Commerce, Left Jackson, Right Congress to regular route. 48 Market Westbound via Navigation to Franklin: Right Chartres, Left Commerce, Left Jackson, Right Congress to regular route. 137 Northshore Express Westbound via Hamilton exit ramp: Right Commerce, Left Jackson, Right Congress to regular route. 236 Maxey Rd/ Baytown Park and Ride (AM Inbound) via Hamilton exit ramp: Right Commerce, Left Jackson, Right Congress to regular route. 244 Monroe Park and Ride P.M. Inbound via Franklin: Right St. Emmanuel, Left Preston (Layover on Preston between Chartres and Hutchins) depart 3 minutes before scheduled time at Congress and LaBranch Via Preston, Left Hutchins, Left Congress, Right Chartres, Left Commerce, Left Jackson, Right Congress to regular route. 246 Bay Area Park and Ride P.M. Inbound via Franklin: Right St. Emmanuel, Left Preston (Layover on Preston between Chartres and Hutchins) depart 3 minutes before scheduled time at Congress and LaBranch Via Preston, Left Hutchins, Left Congress, Right Chartres, Left Commerce, Left Jackson, Right Congress to regular route. 247 Fugua Park and Ride P.M. Inbound - Via Franklin: Right St. Emmanuel, Left Preston (Layover on Preston between Chartres and Hutchins) depart 3 minutes before scheduled time at Congress and LaBranch Via Preston, Left Hutchins, Left Congress, Right Chartres, Left Commerce, Left Jackson, Right Congress to regular route. 248 Eldorado Park and Ride P.M. Inbound via Franklin: Right St. Emmanuel, Left Preston (Layover on Preston between Chartres and Hutchins) depart 3 minutes before scheduled time at Congress and LaBranch Via Preston, Left Hutchins, Left Congress, Right Chartres, Left Commerce, Left Jackson, Right Congress to regular route. 249 Monroe / Bay Area / Fuqua / El Dorado Park and Ride via Franklin: Right St. Emmanuel, Left Preston (Layover on Preston between Chartres and Hutchins) depart 3 minutes before scheduled time at Congress and LaBranch Via Preston, Left Hutchins, Left Congress, Right Chartres, Left Commerce, Left Jackson, Right Congress to regular route. 255 Kingwood Park and Ride A.M. Inbound, Exit HOV Lane to Jackson, Left Franklin, Left Chenevert, Left Commerce, Left LaBranch, Right Congress to regular route. 256 Eastex Freeway Park and Ride A.M. Inbound, Exit HOV Lane to Jackson, Left Franklin, Left Chenevert, Left Commerce, Left LaBranch, Right Congress to regular route. 257 Townsen Park and Ride A.M. Inbound, Exit HOV Lane to Jackson, Left Franklin, Left Chenevert, Left Commerce, Left LaBranch, Right Congress to regular route.